Here’s How the Skill Standards Work. For each competency-based skill included within the Standards, an observable, measurable level of achievement or performance is defined. There are as many as three levels of performance to be evaluated for each skill. The Standards are always being improved. Standards and Evaluations have been written for the 80 machines and tools most used by industry. These have over 240 tasks and operations written for them. More will be added each year. (See bottom of this page.) Firms and Schools work with WCA to write Standards for additional tools, machines, and evaluations needed to match their shop equipment. Scroll down to see definitions of the Skill Levels for each Operation. Click here to see examples from each section. These are entry level skills. 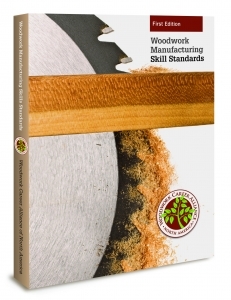 Woodworkers at this level will have skills sufficient to work safely and complete woodworking tasks and operations on machines that are set-up for them. Woodworkers at this level will require a high level of supervision and have limited ability to make independent decisions. Woodworkers at this level will have skills sufficient to do their own set-ups of machines and tooling. They will exhibit knowledge and understanding of tools and materials; will require less supervision and oversight; have a moderate responsibility to make independent decisions; and complete their own set-up of machines and tools. Woodworkers at this level will work independently. They can earn the Machine Specialist Certificate by completing all Level 2 evaluations for all operations on the selected tool or machine. They must be able to supervise and instruct Level 1 and Level 2 woodworkers on that machine; will have a high ability to make independent decisions; and make advanced machine and tool set-ups. Machine Specialists will be able to calibrate machines, troubleshoot operational problems, and create fixtures and job-aids to enhance productivity. Area Specialist Certificates can be granted to a woodworker who earns Machine Specialist for three or more machines in a specific area, such as Sanding, Sawing, or Boring for example. Authors and Editors Recruitment Campaign :: We are in the process of improving and adding to the Woodwork Manufacturing Skill Standards. When YOU are ready to share a little of your knowledge use the CONTACT US form. Let us know which tools and machines you have a passion for. There are no meetings. The time commitment is less than 45 minutes per week, and you set your schedule. The next ten tools are tabbed below, and work is ready to begin. When YOU have tools or machines you’d like to add to the list, let us know via the CONTACT US form. One of the best tool for large panel breakdown . . .
Use of the portable circular saw is still important in some areas. Here we . . . This unique accessory is . . .
For beveling passage doors and . . . Converting a portable router into a mini-shaper is often the correct way to . . . The stationary essential shop tool is used for . . . The dedicated stationary dovetail machine is not found in every plant, but . . . There are a number of popular dovetail fixtures on the market. Using your portable router, this fixture . . . Calculating the flow of your finish is critical to success. This cup . . .
A multiple spindle boring machine, horizontal or vertical, makes . . . Working with an industry veteran, we are updating this important tool.